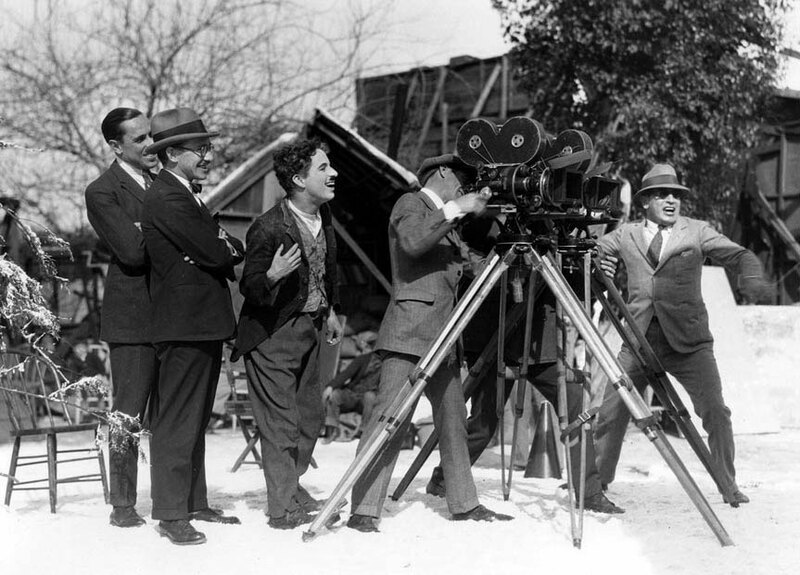 The concept of overcranking and undercranking in the world of film and video production goes back to the origins of motion picture technology. The earliest film cameras required the camera operator to manually crank the film mechanism – they didn’t have internal motors. 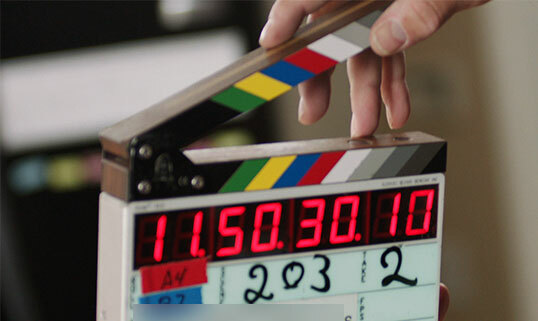 A good camera operator was partially judged by how constant of a frame rate they could maintain while cranking the film through the camera. Prior to the introduction of sound, the correct frame rate was 18fps. If the camera was cranked faster than 18fps (overcranking), then the playback speed during projection was in slow motion. If the camera was cranked slower than 18fps (undercranking), the motion was sped up. With sound, the default frame rate shifted from 18 to 24fps. One by-product of this shift is that the projection of old B&W films gained that fast, jerky motion we often incorrectly attribute to “old time movies” today. That characteristic motion is because they are no longer played at their intended speeds. While manual film cranking seems anachronistic in modern times, it had the benefit of in-camera, variable-speed capture – aka speed ramps. There are modern film cameras that include controlled mechanisms to still be able to do that today – in production, not in post. Once we shifted to high definition, an additional frame rate category of 59.94fps was added to the mix. All of this was still pinned to physical videotape transports and constant frame rates. Slomo and fast speed effects required specialized videotape or disk pack recorders that could playback at variable speeds. A few disk recorders could record at different speeds, but in general, it was a post-production function. Production shifted to in-camera, file-based recording. Post shifted to digital, computer-based, rather than electro-mechanical methods. The nexus of these two shifts is that the industry is no longer locked into a limited number of frame rates. So-called off-speed recording is now possible with nearly every professional production camera. All NLEs can handle multiple frame rates within the same timeline (albeit at a constant timeline frame rate). Modern video displays, the web, and streaming delivery platforms enable viewers to view videos mastered at different frame rates, without being dependent on the broadcast transmission standard in their country or region. Common, possible system frame rates today include 23.98, 24.0, 25.0, 29.97, 30.0, 59.94, and 60.0fps. If you master in one of these, anyone around the world can see your video on a computer, smart phone, or tablet. Since cameras can now record at different rates, it is imperative that the production team and the post team are on the same page. If the camera operator records everything at 29.97 (including sync sound), but the post is designed to be at 23.98, then the editor has four options. 1) Play the files as real-time (29.97 in a 23.98 sequence), which will cause frames to be dropped, resulting in some stuttering on motion. 2) Play the footage at the slowed speed, so that there is a one-to-one relationship of frames, which doesn’t work for sync sound. 3) Go through a frame rate conversion before editing starts, which will result in blended and/or dropped frames. 4) Change the sequence setting to 29.97, which may or may not be acceptable for final delivery. Professional production cameras allow the operator to set both the system or target frame rate, in addition to the actual recording rate. These may be called different names in the menus, but the concepts are the same. The system or target rate is the base frame rate at which this file will be edited and/or played. The record rate is the frame rate at which images are exposed. When the record rate is higher than the target rate, you are effectively overcranking. That is, you are recording slow motion in-camera. (Note: from here on I will use simplified instead of integer numbers in this post.) A record rate of 48fps and a target rate of 24fps results in an automatic 50% slow motion playback speed in post, with a one-to-one frame relationship (no duplicated or blended frames). Conversely, a record rate of 12fps with a target rate of 24fps results in playback that is fast motion at 200%. That’s the basis for hyperlapse/timelapse footage. The good news is that professional production cameras embed the pertinent metadata into the file so that editing and player software automatically knows what to do. Import an ARRI Alexa file that was recorded at 120fps with a target rate of 24fps (23.98/23.976) into Final Cut Pro X or Premiere Pro and it will automatically playback in slow motion. The browser will identify the correct target rate and the clip’s timecode will be based on that same rate. The bad news as that many cameras used in production today are consumer products or at best “prosumer” cameras. They are relatively “dumb” when it comes to such settings and metadata. Record 30fps on a Canon 5D or Sony A7S and you get 30fps playback. If you are cutting that into a 24fps (23.98) sequence, you will have to decide how to treat it. If the use is for non-sound-sync B-roll footage, then altering the frame rate (making it play slow motion) is fine. In many cases, like drone shots and handheld footage, that will be an intentional choice. The slower footage helps to smooth out the vibration introduced by using such a lightweight camera. The worst recordings are those made with iPhone, iPads, or similar devices. These use variable-bit-rate codecs and variable-frame-rate recordings, making them especially difficult in post. For example, an iPhone recording at 30.0fps isn’t exactly at that speed. It wobbles around that rate – sometimes slightly slower and something faster. My recommendation for that type of footage is to always transcode to an optimized format before editing. If you must shoot with one of these devices, you really need to invest in the FiLMiC Pro application, which will give you a certain level of professional control over the iPhone/iPad camera. Time and storage permitting, I generally recommend transcoding consumer/prosumer formats into professional, optimized editing formats, like Avid DNxHD/HR or Apple ProRes. If you are dealing with speed differences, then set your file conversion to change the frame rate. In our 30 over 24 example (29.97 record/23.98 target), the new footage will be slowed accordingly with matching timecode. Recognize that any embedded audio will also be slowed, which changes its sample rate. If this is just for B-roll and cutaways, then no problem, because you aren’t using that audio. However, one quirk of Final Cut Pro X is that even when silent, the altered sample rate of the audio on the clip can induce strange sound artifacts upon export. So in FCPX, make sure to detach and delete audio from any such clip on your timeline. This may have a different name in any given application, but interpret footage is a function to make the application think that the file should be played at a different rate than it was recorded at. You may find this in your NLE, but also in your encoding software. Plus, there are apps that can re-write the QuickTime header information without transcoding the file. Then that file shows up at the desired rate inside of the NLE. 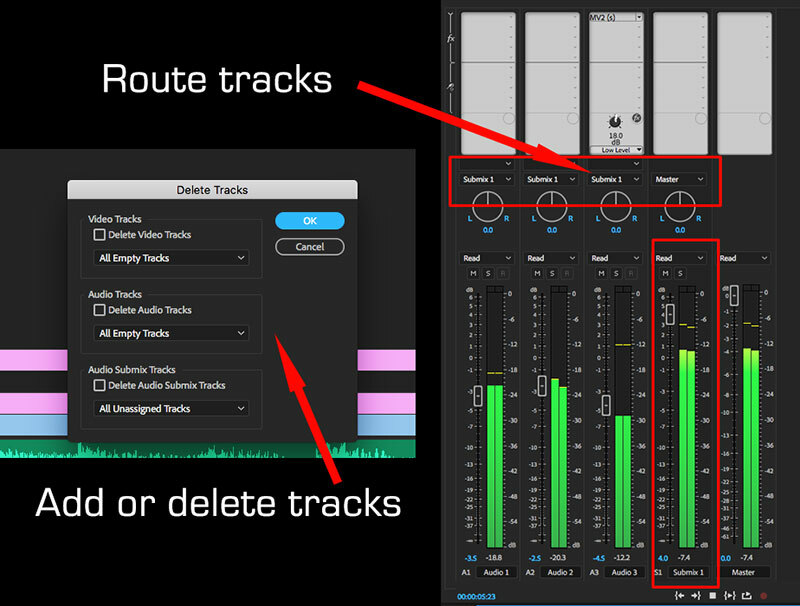 In the case of FCPX, the same potential audio issues can arise as described above if you go this route. In an NLE like Premiere or Resolve, it’s possible to bring in 30-frame files into a 24-frame project. Then highlight these clips in the browser and modify the frame rate. Instant fix, right? Well, not so fast. While I use this in some cases myself, it comes with some caveats. Interpreting footage often results in mismatched clip linking when you are using the internal proxy workflow. The proxy and full-res files don’t sync up to each other. Likewise, in a roundtrip with Resolve, file relinking in Resolve will be incorrect. It may result in not being able to relink these files at all, because the timecode that Resolve looks for falls outside of the boundaries of the file. So use this function with caution. There’s a rub when work with standard speed changes (not frame rate offsets). Many editors simply apply an arbitrary speed based on what looks right to them. Unfortunately this introduces issues like skipping frames. To perfectly apply slow or fast motion to a clip, you MUST stick to simple multiples of that rate, much like traditional film post. A 200% speed increase is a proper multiple. 150% is not. The former means you are playing every other frame from a clip for smooth action. The latter results in only one fourth of the frames being eliminated in playback, leaving you with some unevenness in the movement. Naturally there are times when you simply want the speed you picked, even if it’s something like 177%. That’s when you have to play with the interpolation options of your NLE. Typically these include frame duplication, frame blending, and optical flow. All will give you different looks. When it comes to optical flow, some NLEs handle this better than others. Optical flow “creates” new in-between frames. In the best case it can truly look like a shot was captured at that native frame rate. However, the computation is tricky and may often lead to unwanted image artifacts. If you use Resolve for a color correction roundtrip, changes in motion interpolation in Resolve are pointless, unless the final export of the timeline is from Resolve. If clips go back to your NLE for finishing, then it will be that software which determines the quality of motion effects. Twixtor is a plug-in that many editors use when they need even more refined control over motion effects. Now that I’ve discussed interpreting footage and the ways to deal with standard speed changes, let’s look at how best to handle off-speed clips. The proper workflow in most NLEs is to import the footage at its native frame rate. Then, when you cut the clip into the sequence, alter the speed to the proper rate for frames to play one-to-one (no blended, duplicate, or skipped frames). Final Cut Pro X handles this in the best manner, because it provides an automatic speed adjustment command. This not only makes the correct speed change, but also takes care of any potential audio sample rate issues. With other NLEs, like Premiere Pro, you will have to work out the math manually. The easiest way to get a value that yields clean frames (one-to-one frame rate) is to simply divide the timeline frame rate by the clip frame rate. The answer is the percentage to apply to the clip’s speed in the timeline. Simple numbers yield the same math results as integer numbers. If you are in a 23.98 timeline and have 29.97 clips, then 24 divided by 30 equals .8 – i.e. 80% slow motion speed. A 59.94fps clip is 40%. A 25fps clip is 96%. Going in the other direction, if you are editing in a 29.97 timeline and add a 23.98 clip, the NLE will normally add a pulldown cadence (duplicated frames). If you want this to be one-to-one, if will have to be sped up. But the calculation is the same. 30 divided by 24 results in a 125% speed adjustment. And so on. Understanding the nuances of frame rates and following these simple guidelines will give you a better finished product. It’s the kind of polish that will make your videos stand out from those of your fellow editors. When budgets permit and project needs dictate, I will send my mixes out-of-house to one of a few regular mixers. Typically that means sending them an OMF or AAF to mix in Pro Tools. Then I get the mix and split-tracks back, drop them into my Premiere Pro timeline, and generate master files. On the other hand, a lot of my work is cutting simple commercials and corporate presentations for in-house use or the web, and these are often less demanding – 2 to 8 tracks of dialogue, limited sound effects, and music. It’s easy to do the mix inside of the NLE. 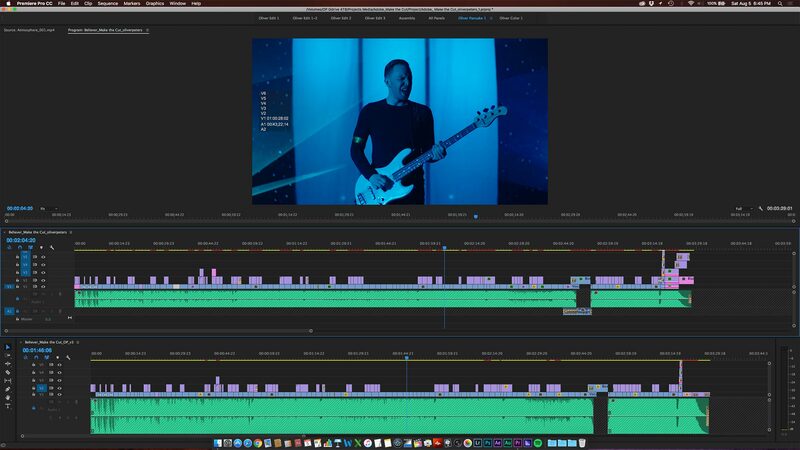 Bear in mind that I can – and often have – done such a mix in Apple Logic Pro X or Adobe Audition, but the tools inside Premiere Pro are solid enough that I often just keep everything – mix included – inside my editing application. Let’s walk though that process. Start with your camera files or double-system audio recordings. Depending on the camera model, Premiere Pro will see these source clips as having either stereo (e.g. a Canon C100) or multi-channel mono (e.g. ARRI Alexa) channels. If you recorded a boom mic on channel 1 and a lavaliere mic on channel 2, then these will drop onto your stereo timeline either as two separate mono tracks (Alexa) – or as a single stereo track (C100), with the boom coming out of the left speaker and the lav out of the right. Which one it is will strictly depend on the device used to generate the original recordings. 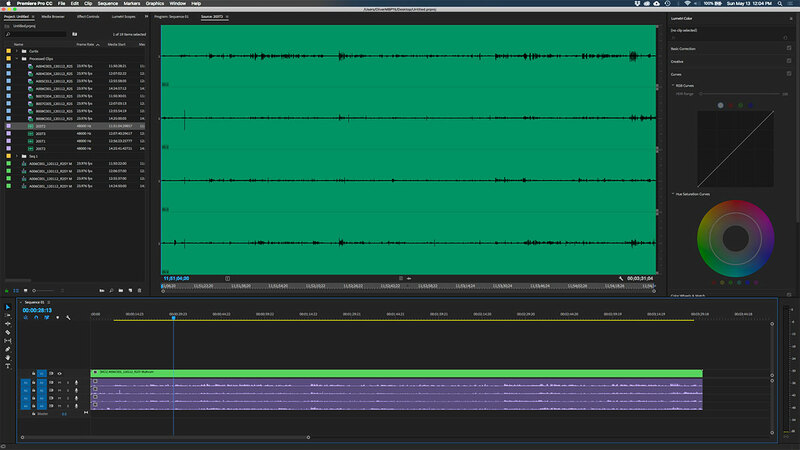 First, when dual-mic recordings appear as stereo, you have to understand how Premiere Pro deals with stereo sources. Panning in Premiere Pro doesn’t “shift” the audio left, right, or center. Instead, it increases or decreases the relative volume of the left or right half of this stereo field. In our dual-mic scenario, panning the clip or track full left means that we only hear the boom coming out of the left speaker, but nothing out of the right. There are two ways to fix this – either by changing the channel configuration of the source in the browser – or by changing it after the fact in the timeline. Browser changes will not alter the configuration of clips already edited to the timeline. You can change one or more source clips from stereo to dual-mono in the browser, but you can’t make that same type of change to a clip already in your sequence. Let’s assume that you aren’t going to make any browser changes and instead just want to work in your sequence. If your source clip is treated as dual-mono, then the boom and lav will cut over to track 1 and 2 of your sequence – and the sound will be summed in mono on the output to your speaks. However, if the clip is treated as stereo, then it will only cut over to track 1 of your sequence – and the sound will stay left and right on the output to your speakers. When it’s dual-mono, you can listen to one track versus the other, determine which mic sounds the best, and disable the clip with the other mic. Or you can blend the two using clip volume levels. If the source clip ends up in the sequence as a stereo clip, then you will want to determine which one of the two mics you want to use for the best sound. To pick only one mic, you will need to change the clip’s audio configuration. When you do that, it’s still a stereo clip, however, both “sides” can be supplied by either one of the two source channels. So, both left and right output will either be the boom or the lav, but not both. If you want to blend both mics together, then you will need to duplicate (option-drag) the audio clip onto an adjacent timeline track, and change the audio channel configuration for both clips. One would be set to the boom for both channels and the other set to only the lav for its two channels. Then adjust clip volume for the two timeline clips. Like most editors, while I’m working through the stages of rough cutting on the way to an approved final copy, I will have a somewhat messy timeline. I may have multiple music cues on several tracks with only one enabled – just so I can preview alternates for the client. I will have multiple dialogue clips on a few tracks with some disabled, depending on microphone or take options. But when I’m ready to move to the finishing stage, I will duplicate that sequence to create a “final version” and clean that one up. This means getting rid of any disabled clips, collapsing my audio and video clips to the fewest number of tracks, and using Premiere’s track creation/deletion feature to delete all empty tracks – all so I can have the least amount of visual clutter. In other blog posts, I’ve discussed working with additional submix buses to create split-track exports; but, for most of these smaller jobs, I will only add one submix bus. (I will explain its purpose in a moment.) Once created, you will need to open the track mixer panel and route the timeline channels from the master to the submix bus and then the output of the submix bus back to the master. Premiere Pro CC comes with a nice set of audio plug-ins, which can be augmented with plenty of third-party audio effects filters. I am partial to Waves and iZotope, but these aren’t essential. However, there are several that I do use quite frequently. These three third-party filters will help improve any vocal-heavy piece. The first two are Vocal Rider and MV2 from Waves and are designed specifically for vocal performances, like voice-overs and interviews. These can be pricey, but Waves has frequent sales, so I was able to pick these up for a fraction of their retail price. Vocal Rider is a real-time, automatic volume adjustment tool. 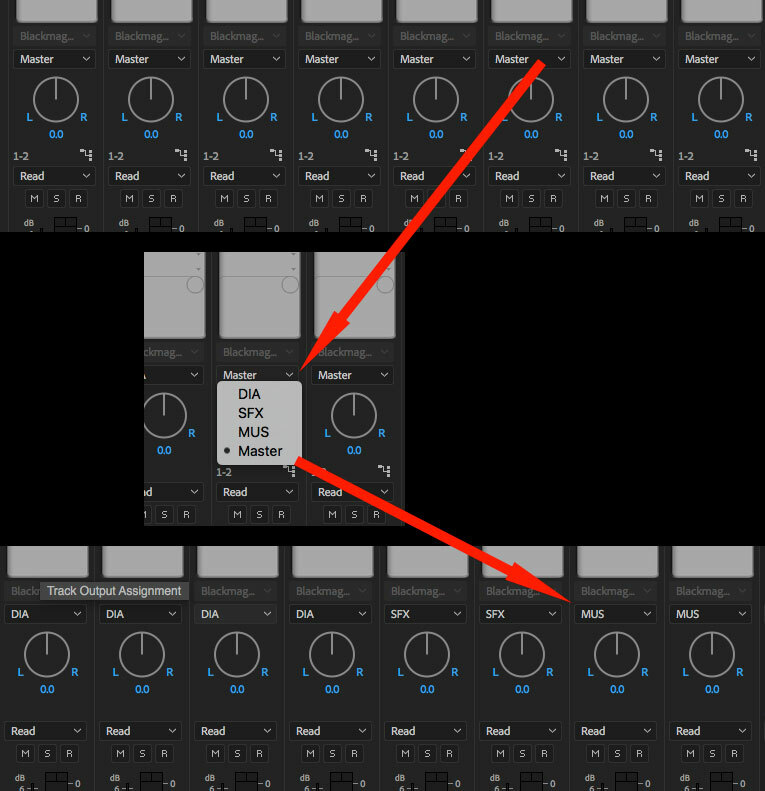 Set the bottom and top parameters and let Vocal Rider do the rest, by automatically pushing the volume up or down on-the-fly. MV2 is similar, but it achieves this through compression on the top and bottom ends of the range. While they operate in a similar fashion, they do produce a different sound. I tend to pick MV2 for voice-overs and Vocal Rider for interviews. We all know location audio isn’t perfect, which is where my third filter comes in. 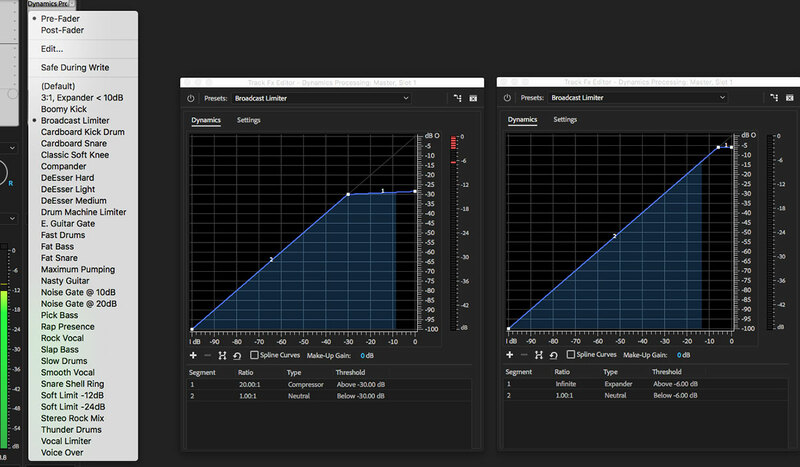 FxFactory is knows primarily for video plug-ins, but their partnership with Crumplepop has added a nice set of audio filters to their catalog. I find AudioDenoise to be quite helpful and fast in fixing annoying location sounds, like background air conditioning noise. It’s real-time and good-sounding, but like all audio noise reduction, you have to be careful not to overdo it, or everything will sound like it’s underwater. For my other mix needs, I’ll stick to Premiere’s built-in effects, like EQ, compressors, etc. One that’s useful for music is the stereo imager. 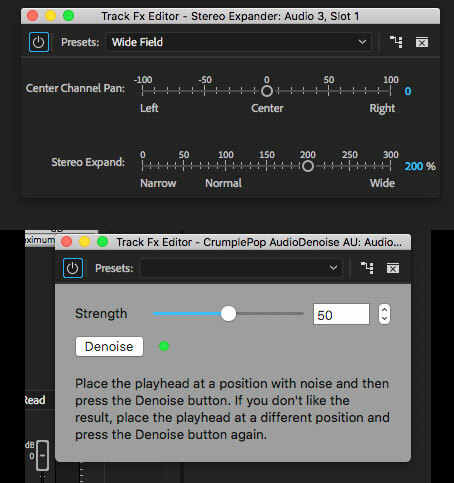 If you have a music cue that sounds too monaural, this will let you “expand” the track’s stereo signal so that it is spread more left and right. This often helps when you want the voice-over to cut through the mix a bit better. My last plug-in is a broadcast limiter that is placed onto the master bus. I will adjust this tight with a hard limit for broadcast delivery, but much higher (louder allowed) for web files. Be aware that Premiere’s plug-in architecture allows you to have the filter take affect either pre or post-fader. In the case of the master bus, this will also affect the VU display. 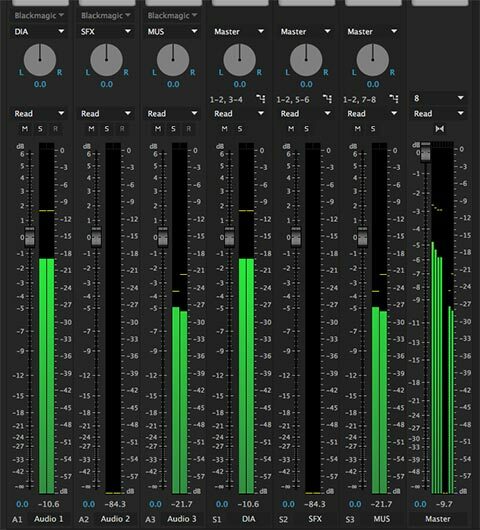 In other words, if you place a limiter post-fader, then the result will be heard, but not visible through the levels displayed on the VU meters. I have used different mixing strategies over the years with Premiere Pro. I like using the write function of the track mixer to write fader automation. However, I have lately stopped using it – instead going back to manual keyframes within the clips. The reason is probably that my projects tend to get revised often in ways that change timing. 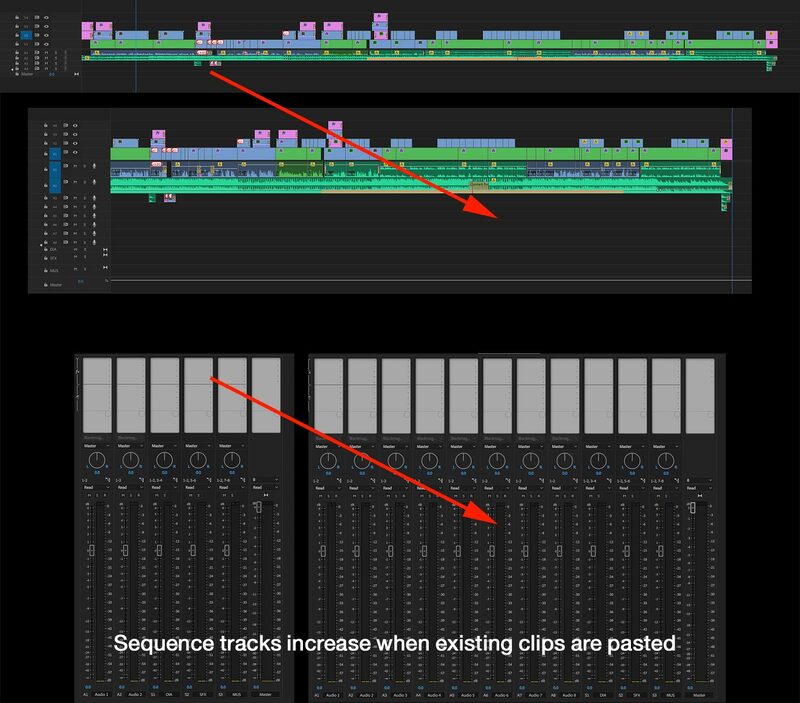 Since track automation is based on absolute timeline position, keyframes don’t move when a clip is shifted, like they would when clip-based volume keyframes are used. Likewise, Adobe has recently added Audition’s ducking for music to Premiere Pro. This uses Adobe’s Sensei artificial intelligence. Unfortunately I don’t find to be “intelligent” enough. Although sometimes it can provide a starting point. For me, it’s simply too coarse and doesn’t intelligently adjust for areas within a music clip that swell or change volume internally. Therefore, I stick with minor manual adjustments to compensate for music changes and to make the vocal parts easy to understand in the mix. Then I will use the track mixer to set overall levels for each track to get the right balance of voice, sound effects, and music. 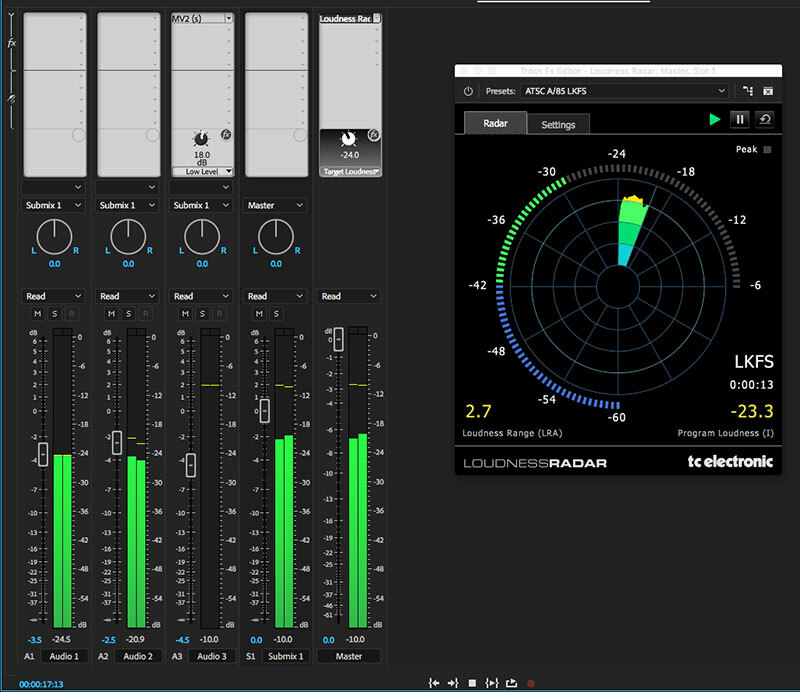 Once I have a decent balance to my ears, I will temporarily drop the TC Electronic (included with Premiere Pro) Radar loudness plug-in to make sure my mix is CALM-compliant. This is where the submix bus comes in. If I like the overall balance, but I need to bring everything down, it’s an easy matter to simply lower the submix level and remeasure. Likewise, it’s customary to deliver web versions with louder volume levels than the broadcast mix. Again the submix bus will help, because you cannot raise the volume on the master – only lower it. If you simply want to raise the overall volume of the broadcast mix for web delivery, simply raise the submix fader. Note that when I say louder, I’m NOT talking about slamming the VUs all the way to the top. Typically, a mix that hits -6 is plenty loud for the web. So, for web delivery, I will set a hard limit at -6, but adjust the mix for an average of about -10. Hopefully this short explanation has provided some insight into mixing within Premiere Pro and will help you make sure that your next project sounds great. Creating multichannel, “split-track” master exports of your final sequences is something that should be a standard step in all of your productions. It’s often a deliverable requirement and having such a file makes later revisions or derivative projects much easier to produce. 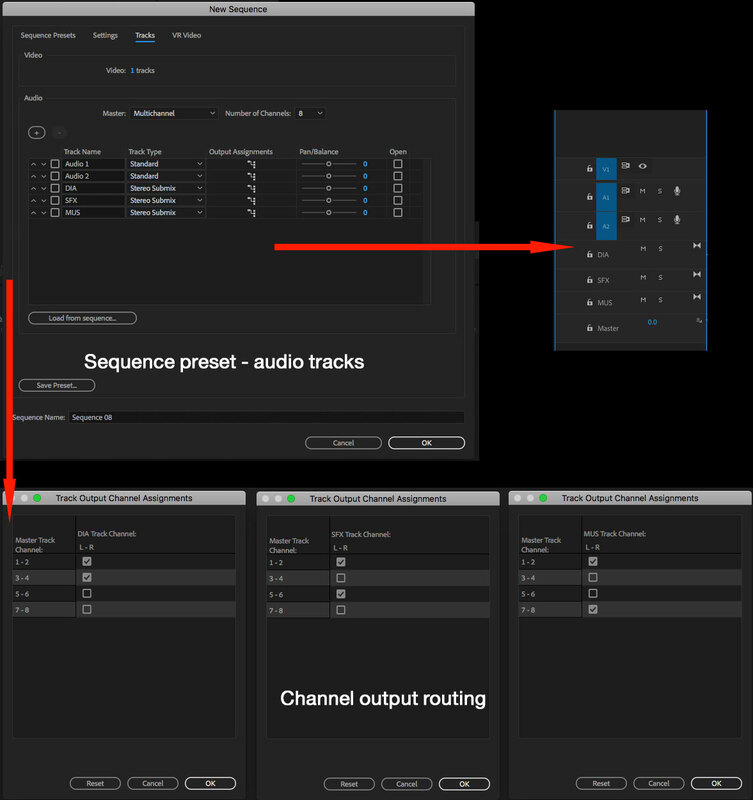 If you are a Final Cut Pro X user, the “audio lanes” feature makes it easy to organize and export sequences with isolated channels for dialogue, music, and effects. FCPX pros like to tweak the noses of other NLE users about how much easier it is in FCPX. While that’s more or less true – and, in fact, can be a lot deeper than simply a few aggregate channels – that doesn’t mean it’s particularly hard or less versatile in Premiere Pro. Last year I wrote about how to set this up using Premiere submix tracks, which is a standard audio post workflow, common to most DAW and mix applications. Go back and read the article for more detail. But, what about sequences that are already edited, which didn’t start with a track configuration already set up with submix tracks and proper output routing? In fact, that’s quite easy, too, which brings me to today’s post. Start out by editing as you always have, using your standard sequence presets. I’ve created a few custom presets that I normally use, based on the several standard formats I work in, like 1080p/23.976 and 1080p/29.97. These typically require stereo mixes, so my presets start with a minimum configuration of one picture track, two standard audio tracks, and stereo output. This is the starting point, but more video and audio tracks get added, as needed, during the course of editing. Get into a habit of organizing your audio tracks. Typically this means dialogue and VO tracks towards the top (A1-A4), then sound effects (A5-A8), and finally music (A9-A12). Keep like audio types on their intended tracks. What you don’t want to do is mix different audio types onto the same track. For instance, don’t put sound effects onto tracks that you’ve designated for dialogue clips. Of course, the number of actual tracks needed for these audio types will vary with your projects. A simple VO+music sequence will only have two to four tracks, while dramatic entertainment pieces will have a lot more. Delete all empty audio tracks when you are ready to mix. Mix for stereo output as you normally would. This means balancing components using keyframes and clip mixing. Then perform overall adjustments and “riding faders” in the track mixer. This is also where I add global effects, like compression for dialogue and limiting for the master mix. Output your final mixed master file for delivery. The next step is to create or open a new multichannel DME (dialogue/music/effects) sequence. I’ve already created a custom preset, which you may download and install. It’s set up as 1080p/23.976, with two standard audio channels and three, pre-labelled stereo submix channels, but you can customize yours as needed. The master output is multichannel (8-channels), which is sufficient to cover stereo pairs for the final mix, plus isolated pairs for each of the three submixes – dialogue, music, and effects. Next, copy-and-paste all clips from your final stereo sequence to the new multichannel sequence. If you have more than one track of picture and two tracks of audio, the new blank sequence will simply auto-populate more tracks once you paste the clips into it. The result should look the same, except with the additional three submix tracks at the bottom of your timeline. At this stage, the output of all tracks is still routed to the stereo master output and the submix tracks are bypassed. Now open the track mixer panel and, from the pulldown output selector, switch each channel from master to its appropriate submix channel. Dialogue tracks to DIA, music tracks to MUS, and effects tracks to SFX. The sequence preset is already set up with proper output routing. All submixes go to output 1 and 2 (composite stereo mix), along with their isolated output – dialogue to 3 and 4, effects to 5 and 6, music to 7 and 8. As with your stereo mix, level adjustments and plug-in processing (compression, EQ, limiting, etc.) can be added to each of the submix channels. Note: while not essential, multichannel, split-track master files are most useful when they are also textless. So, before outputting, I would recommend disabling all titles and lower third graphics in this sequence. The result is clean video – great for quick fixes later in the event of spelling errors or a title change. Now that the sequence is properly organized, you’ve got to export the multichannel sequence. I have created a mastering export preset, which you may also download. 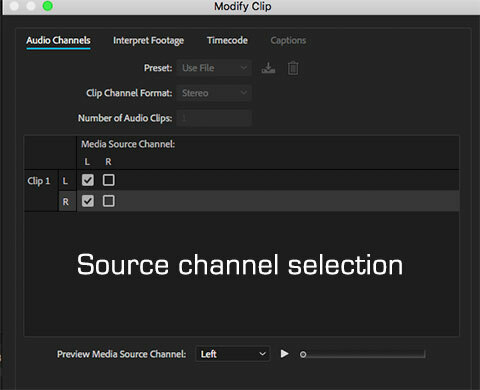 It works in the various Adobe CC apps, but is designed for Adobe Media Encoder workflows. This preset will match its output to the video size and frame rate of your sequence and master to a file with the ProRes4444 codec. The audio is set for eight output channels, configured as four stereo pairs – composite mix, plus three DME channels. To test your exported file, simply reimport the multichannel file back into Premiere Pro and drop it onto a timeline. There you should see four independent stereo channels with audio organized according to the description above. I have created a sequence and an export preset, which you may download here. I have only tested these on Mac systems, where they are installed into the Adobe folder contained within the user’s Documents folder. 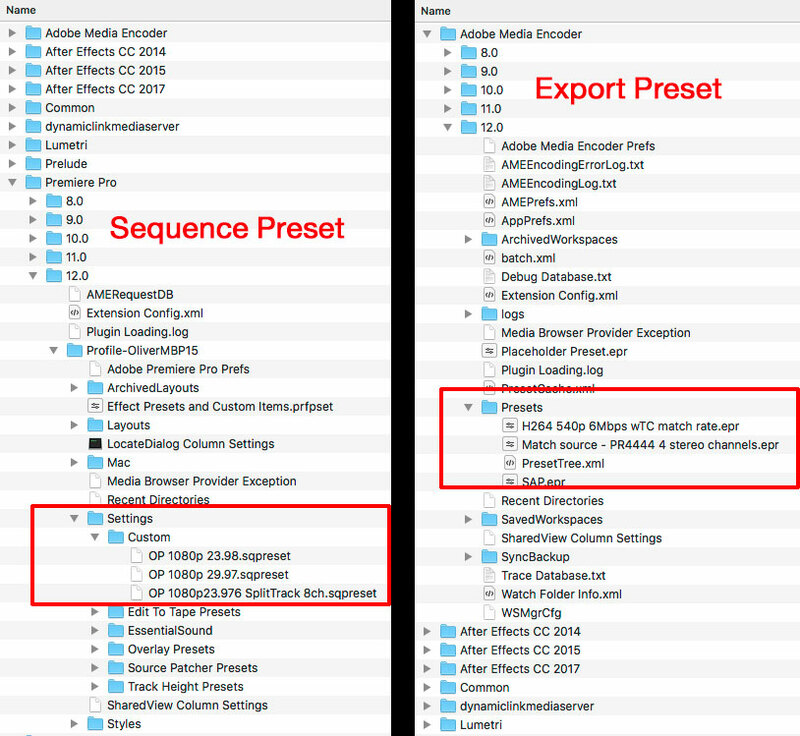 The sequence preset is placed into the Premiere Pro folder and the export preset into the Adobe Media Encoder folder. If you’ve updated the Adobe apps along the way, you will have a number of version subfolders. As of December 2017, the 12.0 subfolder is the correct location. Happy mixing! 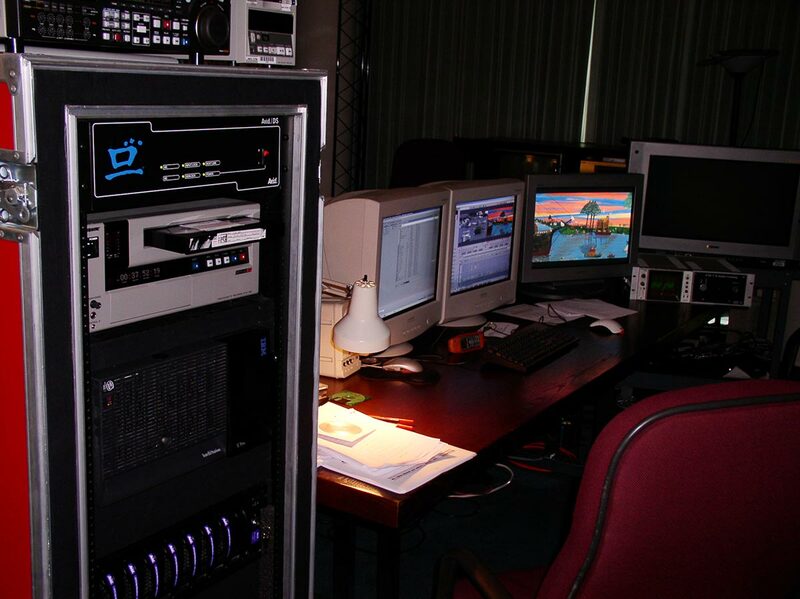 When I started video editing, the norm was an edit suite with three large quadraplex (2”) videotape recorders, video switcher, audio mixer, B&W graphics camera(s) for titles, and a computer-assisted, timecode-based edit controller. This was generally considered an “online edit suite”, but in many markets, this was both “offline” (creative cutting) and “online” (finishing). Not too long thereafter, digital effects (ADO, NEC, Quantel) and character generators (Chyron, Aston, 3M) joined the repertoire. 2” quad eventually gave way to 1” VTRs and those, in turn, were replaced by digital – D1, D2, and finally Digital Betacam. A few facilities with money and clientele migrated to HD versions of these million dollar rooms. 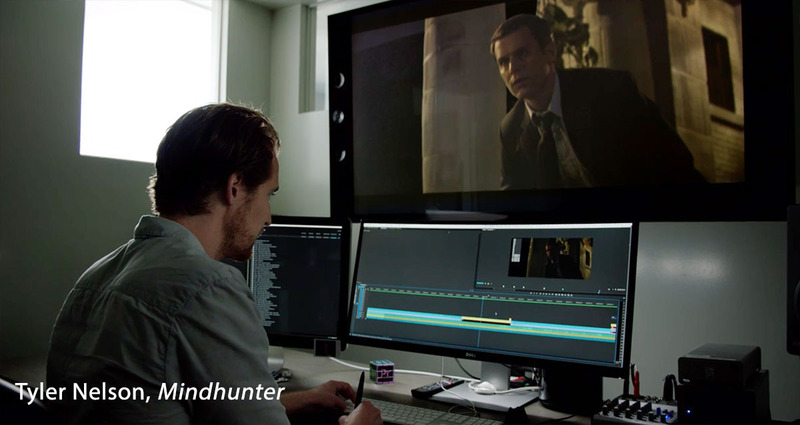 Towards the midpoint in the lifespan for this way of working, nonlinear editing took hold. After a few different contenders had their day in the sun, the world largely settled in with Avid and/or Media 100 rooms. While a lower cost commitment than the large online bays of the day, these nonlinear edit bays (NLE) still required custom-configured Macs, a fair amount of external storage, along with proprietary hardware and monitoring to see a high-quality video image. Though crude at first, NLEs eventually proved capable of handling all the video needs, including HD-quality projects and even higher resolutions today. As technology advanced, computers because faster and more powerful, storage capacities increased, and software that required custom hardware evolved to work in a software-only mode. Today, it’s possible to operate with a fraction of the cost, equipment, and hassle of just a few years ago, let along a room from the mid-70s. 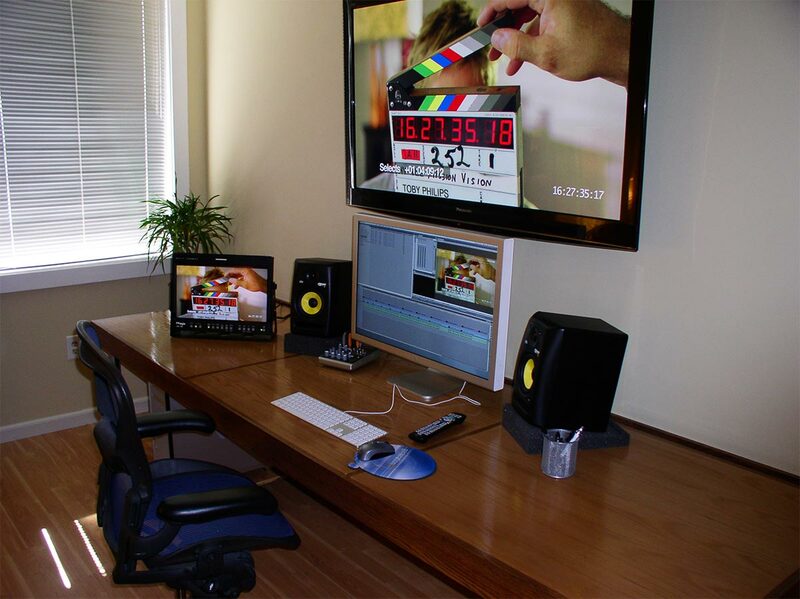 As a result, when designing or installing a new room, it’s important to question the assumptions about what makes a good edit bay configuration. For example, today I frequently work in rooms running newer iMacs, 2013 Mac Pros, and even MacBook Pro laptops. These are all perfectly capable of running Apple Final Cut Pro X, Adobe Premiere Pro, Avid Media Composer, and other applications, without the need for additional hardware. In my interview with Thomas Grove Carter, he mentioned often working off of his laptop with a connected external drive for media. And that’s at Trim, a high-end London commercial editing boutique. In my own home edit room, I recently set aside my older Mac Pro tower in favor of working entirely with my 2015 MacBook Pro. No more need to keep two machines synced up and the MBP is zippier in all respects. With the exception of some heavy-duty rendering (infrequent), I don’t miss using the tower. I run the laptop with an external Dell display and have configured my editing application workspaces around a single screen. The laptop is closed and parked in a BookArc stand tucked behind the Dell. But I also bought a Rain stand for those times when I need the MBP open and functioning as a second display. I find more and more editors working in similar configurations. For example, one of my clients is a production company with seven networked (NAS storage) workstations. Most of these are iMacs with few other connected peripherals. The main room has a 2013 “trash can” Mac Pro and a bit more gear, since this is the “hero” room for clients. If you are looking to downsize your editing environment, here are some pointers. While you can work strictly from a laptop, I prefer to build it up for a better experience. Essential for me is a Thunderbolt dock. Check out OWC or CalDigit for two of the best options. This lets you connect the computer to the dock and then everything else connects to that dock. One Thunderbolt cable to the laptop, plus power for the computer, leaving you with a clean installation with an easy-to-move computer. From the dock, I’m running a Presonus Audiobox USB audio interface (to a Mackie mixer and speakers), a TimeMachine drive, a G-Tech media drive, and the Dell display. If I were to buy something different today, I would use the Mackie Onyx Blackjack interface instead of the Presonus/Mackie mixer combo. The Blackjack is an all-in-one solution. At the production company’s hero room, we have the extra need to drive some video monitors for color correction and client viewing. That room is similarly configured as above, except with a Mac Pro and connection to a QNAP shared storage solution. The latter connects over 10Gb/s Ethernet via a Sonnet Thunderbolt/Ethernet adapter. When we initially installed the room, video to the displays was handled by a Blackmagic Design UltraStudio device. However, we had a lot of playback performance issues with the UltraStudio, especially when using FCPX. After some experimenting, we realized that both Premiere Pro and FCPX can send a fullscreen, [generally] color-accurate signal to the wall-mounted flat panel using only HDMI and no other video i/o hardware. We ended up connecting the HDMI from the dock to the display and that’s the standard working routine when we are cutting in either Premiere Pro or Final Cut. 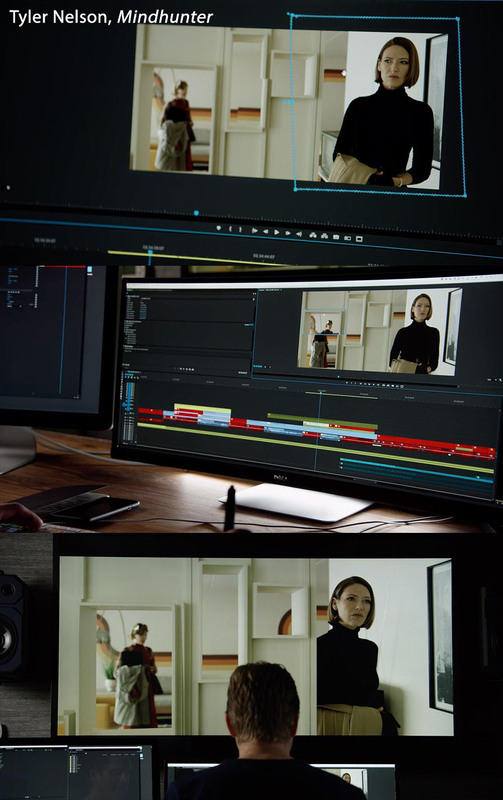 The rub for us is DaVinci Resolve. You must use some type of Blackmagic Design hardware product in order to get fullscreen video to a display when in Resolve. Therefore, the Ultrastudio’s HDMI port connects to the second HDMI input of the large client display and SDI feeds a separate TV Logic broadcast monitor. This is for more accurate color rendition while grading. With Media Composer, there were no performance issues, but the audio and video signal wants to go through the same device. So, if we edit Avid, then the signal chain goes through the UltraStudio, as well. All of this means that in today’s world, you can work as lightly as you like. Laptop-only – no problem. iMac with some peripherals – no problem. A fancy, client-oriented room – still less hassle and cost than just a few short years ago. Load it up with extra control surfaces or stay light with a keyboard, mouse, or tablet. It all works today – pretty much as advertised. Gone are the days when you absolutely need to drop a small fortune to edit high-quality video. You just have to know what you are doing and understand the trade-offs as they arise. Most days I find myself in front of Adobe Premiere Pro CC, both by choice and by the jobs I’m booked on. Yes, I know, for some it’s got bugs and flaws, but for me it’s generally well-behaved. 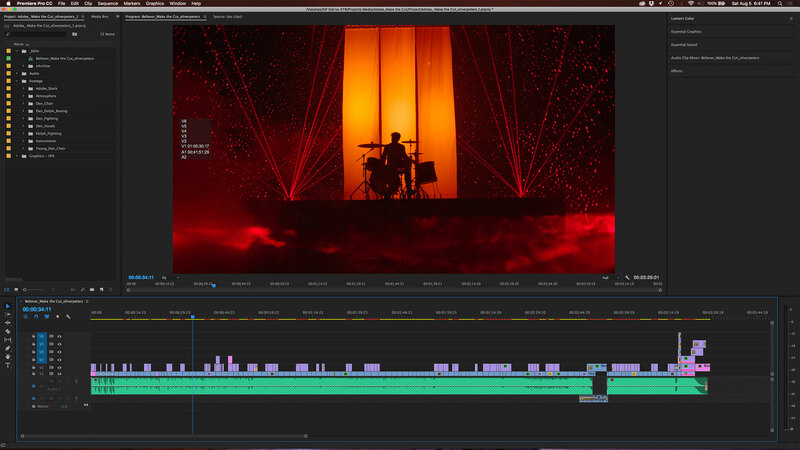 Given the choices out there, Premiere Pro feels the most natural to me for an efficient editing workflow. Part of what makes Premiere Pro work for me is the ability to customize and fine-tune the user interface layout for the way I like to work or the tasks at hand. This is made possible by Adobe’s use of panels for the various tools and windows within the interface. These panels can float or be docked, stacked, or tabbed in a wonderfully large range of configuration possibilities. 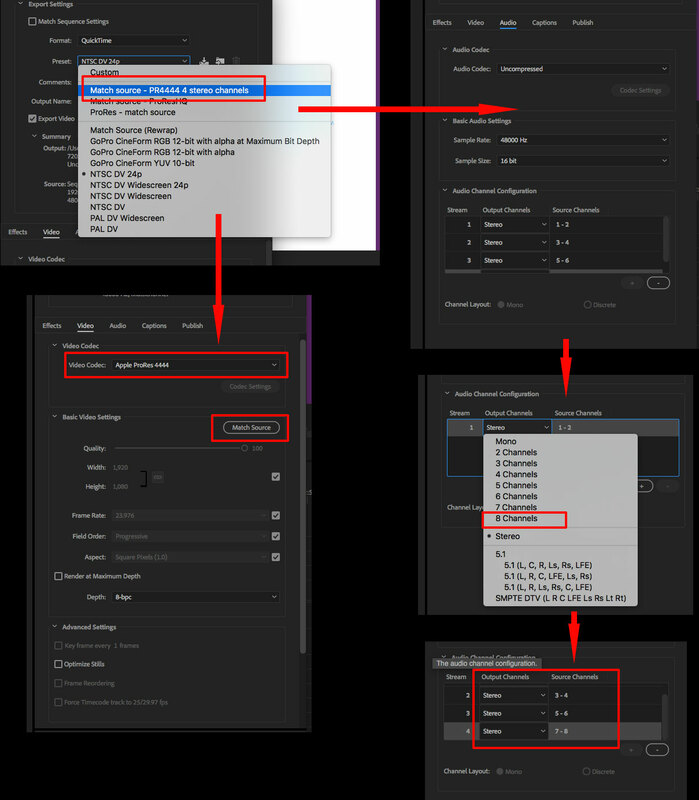 The Adobe CC applications come with a set of preset workspaces, but these can be customized and augmented as needed. I won’t belabor this post with an in-depth explanation of workspaces, because there are three very good explanations over at PremiereBro. (Click these links for Post 1, Post 2, and Post 3). My discussion with Simon Ubsdell made me think the topic would make a good blog post here, too. I started my NLE journey with Avid and in the early days, two screens (preferably of a matching size) were essential. Bins on the left with viewers and timeline on the right. However, in the intervening years, screen resolution has greatly increased and developers have made their UIs work on dual and single-screen configurations. Often today, two screens can actually be too much. For example, if you have two side-by-side 27” (or larger) displays, the distance from the far left to the far right is pretty large. This makes your view of the record window quite a bit off-center. To counter-balance this issue, in a number of set-ups, I’ve taken to working with two different sized displays: a centered 27”, plus a smaller 20” display to the left. Sometimes I’ll have a broadcast display to the right. The left and right displays are at an angle, which means that my main working palette – the viewers and timeline – are dead-center on the display in front of me. 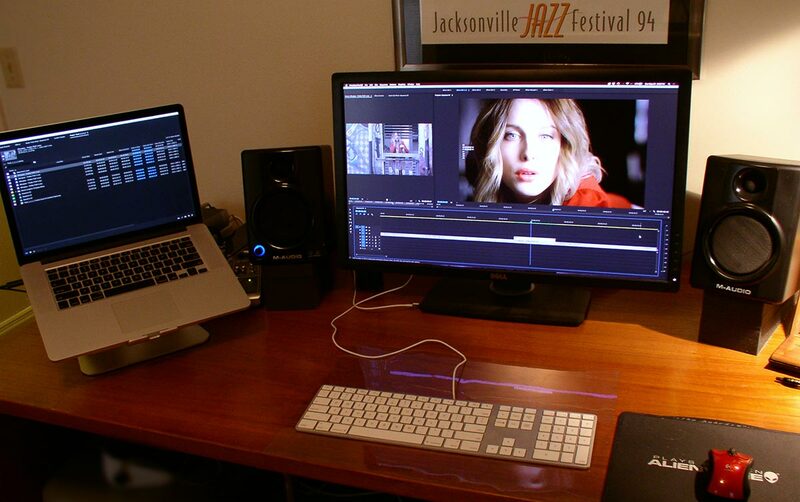 I also work with a laptop from time to time, as well as do some jobs in Final Cut Pro X. Generally a laptop is going to be the only available display and FCPX is well-optimized for single-screen operation. As a result, I’ve started to play around with working entirely on a single display – only occasionally using the landscape of the secondary display on my left when really needed. The more I work this way, the more I find that I can work almost entirely on one screen, if that screen offers a decent resolution. This is the classic two-screen layout. Bins on the left and dual-viewer/timeline on the right. I use this when I have a lot of footage and need to tab a number of bins or expand a bin to see plenty of list details or thumbnails. This layout collapses the classic layout onto a single screen, with the project panel, viewers and timeline. This layout is the one I use most often, because most of what I need is neatly grouped as a tab or a stack on the left and right sides of a single viewer window. Note that there are actually source and record viewers, but they are stacked behind each other. So if I load a clip or match frame from the timeline, the source viewer becomes foremost for me to work with. Do an edit or go back to the timeline and the viewer switches back to the record side. By tabbing panels on the left side, I can select the panel needed at the time. There is a logical order to what is on the left or right side. For instance, scopes are left and Lumetri Color controls on the right – thus, both can be open. Or I can drag an effect from the right pane’s Effects palette onto the Effects Control panel on the left. This is the most minimalist of my workspaces. Just the viewers and timeline. Anything else can be opened as a floating window for temporary access. The point of this workspace is 100% focus on the timeline, with everything else hidden. 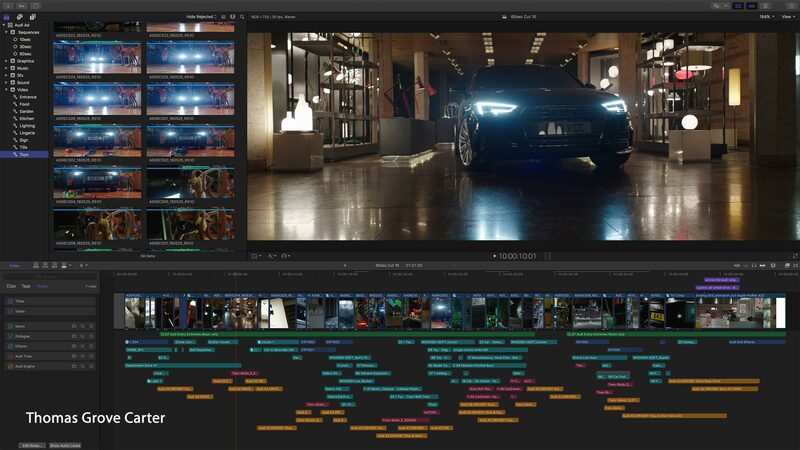 This workspace is designed for the “pancake timeline” style of editing. For example, build a “selects” timeline and then pull from that down to your main editing timeline. This is another dual-display layout optimized for color correction. Lumetri Color and Effects Control panel flanking the viewer, with the Lumetri Scopes fullscreen on the lefthand monitor. There are certainly plenty of other ways you can configure a workspace to suit your style. 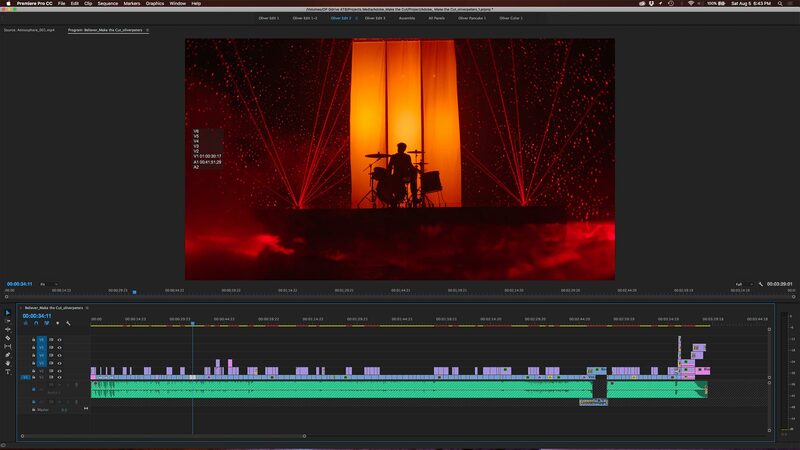 Some Premiere Pro editors like to use the secondary screen to display the timeline panel fullscreen. Or maybe use it to spread out their audio track mixer. Hence the beauty of Adobe’s design – you can make it as minimal or complex as you like. 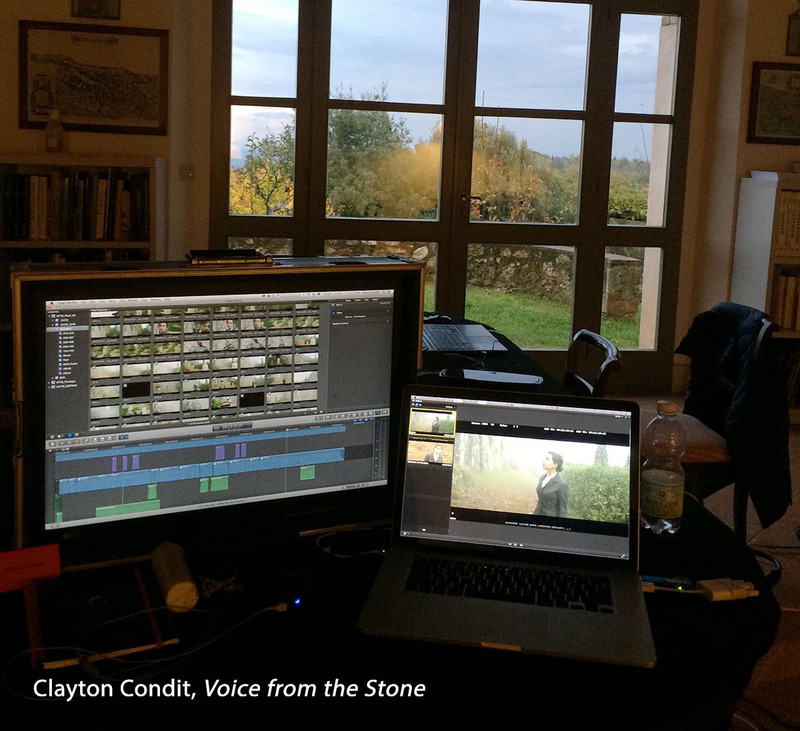 There is no right or wrong approach – simply whatever works to improve your editing efficiency. 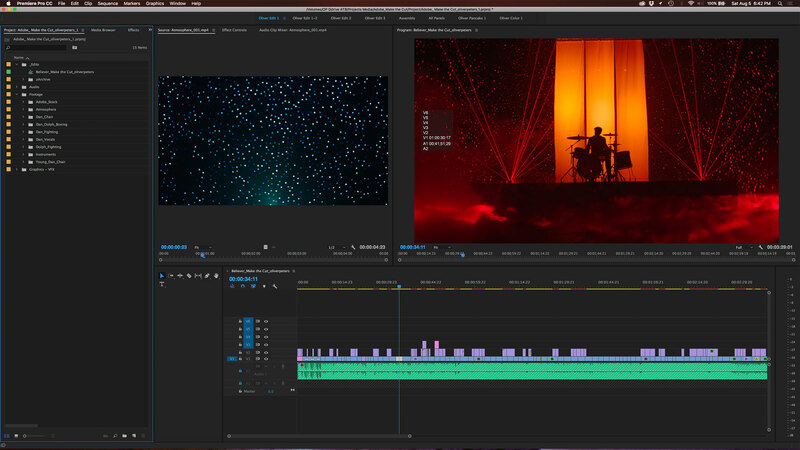 Note: Footage shown within these UI screen grabs is courtesy of Imagine Dragons and Adobe from the Make the Cut Contest.